The Primary Peach: 100 Things to Do - Finish the Year with a Bang! It's always a little sad when you close the door on another teaching year. The kids are gone, the desks are pushed off to the side - empty of their learning contents. The silence once again descends. The year is done. Hey guys, It's Gary from ScrappyGuy designs. When this post goes live there will only be five school days left before this year officially ends. It's bittersweet as I start counting down the last ten years in my teaching career. Retirement is beginning to loom in the headlights. As this happens, I think back on some of the fun activities I've done to end a school year. One of my favorites happens to be something that extends from the last day long into the summer. AND it brings those freshly scrubbed faces back to you the next year. You know you're gonna be missing them by then. I found this list over at the 101 Things website. I tweaked it a little to fit my students more. Near the end of school, I hand them out and ask them to check off at least 25 things. If they do that and bring it back to me in August, I usually let them visit the Treasure Chest in my room. This way I can check in on them. See how their summer went. Ask who they have for a teacher this year. Reconnect with them and wish them luck on another successful school year. Hopefully your students will come running back to see you just one more time before they move on. 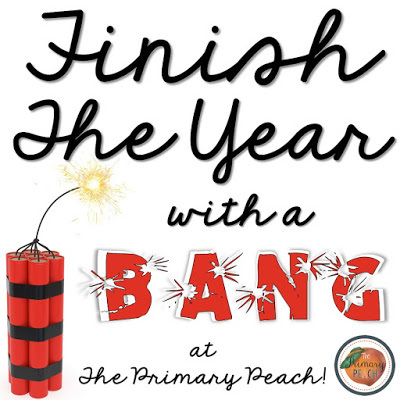 For even more ideas from The Primary Peach, be sure to follow us on Instagram, Pinterest, and Facebook to catch all the latest news and updates. Love, love, love this list! Printing and sticking in report card envelopes right now! Thanks for sharing. บาคาร่า The site is one that has gambling games to like. Can play more easily. It is a gamble to choose to play it all. Gamblers will play well. Make a bet that you will play yourself all the fun anywhere, do not have to waste time. Where to play gamblers here? Enjoy all the fun. Make a substantial income. There are betting games to choose from. To experience the fun. Where can I gamble myself anywhere? Make a bet every day. Anyone who likes or is interested in playing gambling at any time has a simpler betting game.